and ordered the water is, the more useful it is to the body. That’s a startling admission! Still, according to Pollock, the confusion really stems from the mystery of how water seems to structure itself with surprising complexity on an atomic and molecular level in response to various stimuli. That might seem like a mere “That’s cool!”tidbit of scientific trivia. However, what Pollock and other researchers are finding out is that water is more than moisture and hydration for the body. Water is not only the source of all life, it is the architect of all life. “How can that be?” you ask. 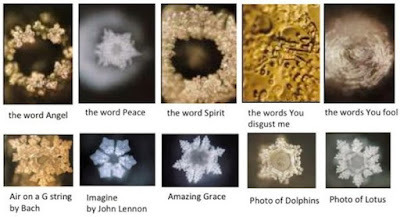 If you are not familiar with the work of Dr. Masaru Emoto, then I strongly recommend watching the video on the left. You will see that living water, the kind of water that comes from pristine mountain springs, the healing waters of Lourdes and the Ganges river, and the water we infuse with our own positive thought patterns is very different from ordinary water. The microscopes and cameras do not lie. The water does not lie. When we look at water with this understanding, it shows us what our hearts already know. Our thoughts have power. Whatever we’re thinking, that’s what we’re sending out into the world. Thoughts and images of tenderness and beauty quicken the life force of nature within and around us. Those full of hate and strife destroy that connection. While, the full implications of these discoveries have yet to be assessed, the potential of this science, from our vantage point seems to be limitless. As you can see in the video I’ve linked to here, when red blood cells are not receiving a proper negative charge in the watery plasma that surrounds them, they tend to stick together in globs and chains. When the red blood cells are packed together too closely, this prevents them from getting a full load of oxygen to deliver to the other cells of the body. As shown by the doctor in the video, when a person drinks even a small amount of structured water, the red blood cells separate, which increases the amount of oxygen getting to the body. More oxygen to your cells means more life, more energy and less disease. Still, its important to keep in mind, the dramatic results of this experiment only scratch the surface of the full promise of structured water. Structured, negatively charged water seems to be a crucial component of all cellular processes. 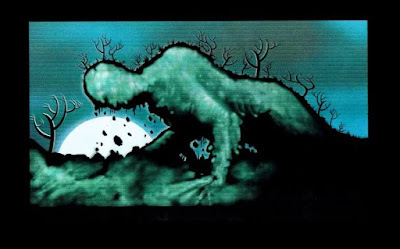 It also appears that nutrients and minerals are absorbed more deeply, waste matter and worn-out electrochemical material are ejected more thoroughly and efficiently in a medium of structured water. found in snowflakes, occurs when water comes in contact with positive energy. Negative energy ravages and disrupts that process. Of all of the strange and wonderful kinds of knowledge I’ve explored recently, none generates more cynicism and ridicule as does structured water. I believe there are good reasons for this, other than the fact that left-brainers, ironically in this case, have a hard time believing their eyes! When the world realizes that water records vibrational energy, it will spell the end of several parasitic cartels and monopolies. The pharmaceutical and medical industries will have to learn to survive with fewer sick patients. The lawyers will have fewer opportunities to cash in on crime. The arms dealers, warmongers and world manipulators will have a much harder time convincing humans to kill each other in their wars. The old divide-and-conquer playbook of the governing class will be totally obsolete. However, I think the biggest threat to the status quo of woe is this; we’ll eventually learn in more detail what water is telling us. The big lies, hoaxes and deceptions that have blinded the human race to our true spiritual origin and destiny will be blown out of the water, for good. The adverse effects of fluoride on the pineal gland, and overall brain health are well known. Yet, the six-decades old fluoridation campaign by U.S. government, dental and medical establishments, industrial manufacturers and public relations firms continues. This powerful fluoride cartel still engages in the tactics of ridicule and professional exile for independent medical researchers who bring to light fluoride’s links to cancer, Alzheimer’s disease, lowered IQ, osteoporosis and other serious problems. The good news is that despite the cartel’s attempts at sabotage and propaganda, more information is getting out. People are beginning to rethink fluoride. When I started looking into the problem of stealth toxicity from chemicals and metals, I had no idea of the level of exposure that most of us deal with in our modern world. Although pharmaceutical companies try to deny it, extremely high levels of mercury and aluminum have been found in vaccines and flu shots . However, when fluoride combines with these and other toxic metals, it most likely increases their absorption through the intestinal wall. Fluoride also makes it easier for aluminum particles to pass through the blood-brain barrier. This phenomenon has been linked to Parkinson’s, ALS and Alzheimer’s disease    . Acidic food products like tomato sauce, soft drinks and beer cause aluminum to seep from aluminum cookware and containers. Antiperspirants contain high levels of aluminum that can lead to breast cancer. Most antacids contain aluminum. It’s added to salt, cocoa, and baking powder. Aluminum is used as a base for many cosmetic products. Most municipal water companies also add aluminum to the water supply as a scrubbing agent. . It seems to me at least, we’re all getting more than our fair share of aluminum. The catalog of the disease-causing toxins that humans have introduced into the environment and food and drug supply is astounding   . It seems overwhelming when we are trying to minimize our exposure and the harm these substances cause to our health. Granted, there is probably no way to completely eliminate toxins from our post-modern lives. However, with knowledge, willingness to change and some discipline in making choices, we can do a great deal to increase longevity and quality of life. Once we simply minimize our intake of toxins and give the body what it needs to heal and repair, health, energy and inner power are within our grasp. I’m working on a whole other article about water and its healing properties but for now, let me say this. When you’re getting accumulated fluoride and other harmful toxins out of your body, water is the main factor. I’ve been buying distilled or spring water from the supermarket but I’m planning on getting my own distiller soon. The important thing is to cut out as much fluoride as possible, which means staying away from most processed drinks and food and using a source of water that is free of fluoride. I’ve included a few resources below that have helped me to find a way through the toxic wasteland. I will be adding posting more about this topic of reclaiming our body chemistry. This article blew me away! Adding boron, a trace mineral that is essential for life, to my supplementation has improved my health in many ways. Yes, hard to believe, but true. Borax, in tiny, tiny amounts is incredibly healthy. It has definitely helped my sense of taste and smell, which I did not expect. Colors also seem to brighter than before. It think it has increased my spiritual awareness because of the pineal gland support it gives. It has helped my joints and skin. I don’t have aches and pain in legs anymore. It’s powerful information. I’ve watched several videos on iodine. I’ve included a few of the more informative here When it comes to detoxing from fluoride, iodine is very important! As I’ve mentioned and documented before, fluoride, chlorine and bromine, all toxic halogens that are present in our food and water supply, kick out iodine from our glands. because of their similar atomic structure. However, you can eliminate those toxic halogens from your body by using iodine. That’s right, iodine supplementation will reverse the process. The glands will only absorb those harmful halogens when they cannot access enough iodine. Iodine will also boost your immune system by killing blood pathogens like bacteria and viruses. When all that begins taking place, a sense of renewed energy will soon follow. It’s amazing how much difference three drops a day can make!